Rexburg Motorsports is looking to give back to families in need in their community with its Stuff the Side-by-Side Food Drive. 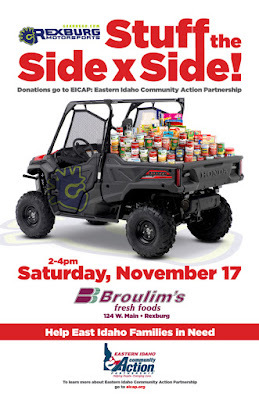 The event runs from 2 until 4 p.m. Saturday, November 17, outside Broulim's in Rexburg. 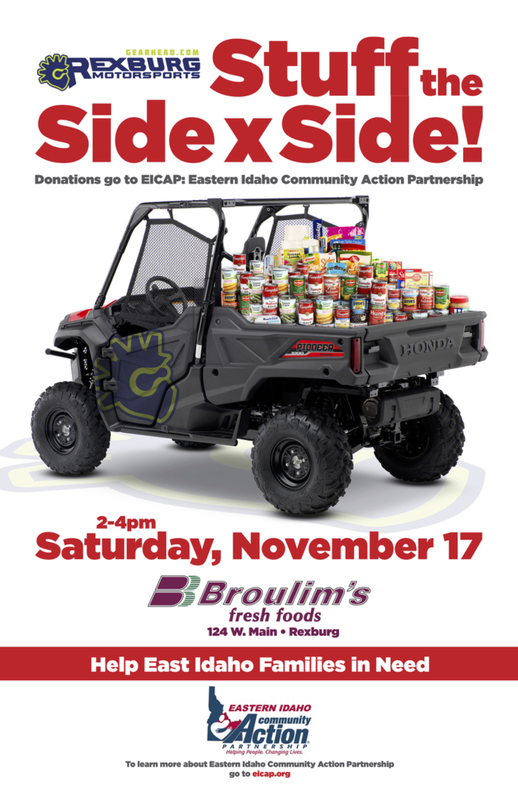 To support the Eastern Idaho Community Action Partnership (EICAP) Rexburg Outreach Office, Rexburg Motorsports is looking for donations of new and unopened food and household items to stuff a Honda Pioneer Side x Side with a half ton of food. The Rexburg Outreach Office is seeking donations for the following unexpired items: canned chicken, canned fruit, cereals, soups, laundry soap, dishwasher soap, cleaning supplies, and various hygiene items. The Honda Pioneer is equipped to hold up to 1,000 pounds of donations in the seats, bed, and storage compartments. Rexburg Motorsports is hoping the vehicle's capacity will be exceeded before the event concludes. To donate, simply stop by the Broulim’s in Rexburg between 2 and 4 p.m. and place your donations in the side-by-side parked outside the store. All donations received will be housed in the food bank in Rexburg and be distributed to families in need in the Madison County area. “We're always looking for ways to help out the community,” said Mike Vickers, Owner of Rexburg Motorsports. "This seemed like a fun way to accomplish that, and to encourage others to get involved." For further questions or information regarding the food drive or Rexburg Motorsports in general, contact, Matt Dyer, at 208-356-4000 or via email at mdyer@gearhead.com. Thanks for posting this information here, it helped me a lot and will surely a lot of other people as well. Our experts are always present for any kind of Mcafee Antivirus help which you require instantly. The well-experienced and certified experts are available 24*7, to give the best support for your computer. Mcafee Antiviruss are the best alternative for everyone at reasonable prices. Its wide variety of antivirus such as norton, eset, and vipre comes in dual technology of scan and secure.